SAN FRANCISCO (AP) — A man injured in the second massive rock fall at Yosemite was driving out of the park when rock and rubble broke through the sunroof of his SUV, hitting him in the head, his wife said. Television images show Jim Evans, of Naples, Florida, conscious and his wife holding a jacket around his bloody head. Evans was airlifted to a hospital in Modesto, California, and is expected to survive, Fresno television station KSEE (http://bit.ly/2x1EnIU) reported. Evans' wife, Rachel Evans, told KSEE that the couple and two other relatives had ended a three-day visit to Yosemite and were leaving Thursday when the rock slide happened. She says no one else in the car was injured. 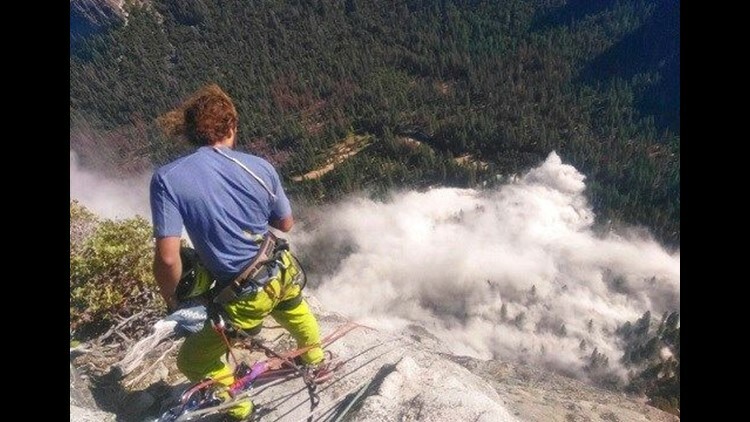 The massive new hunk of granite broke off Thursday at the park's mountaineering mecca of El Capitan, injuring Evans and sending out huge plumes of white dust. "There was so much smoke and debris," said climber Ryan Sheridan, who had just reached the top of El Capitan when the rock let loose below him. "It filled the entire valley with smoke." "It was in the same location of the previous rock fall," Sheridan told The Associated Press by cellphone from the mountain. "A larger rock fall let loose, easily three times the size," Sheridan said. The man killed Wednesday was identified as Andrew Foster, 32, of Wales. The park didn't identify his wife but said she remained hospitalized. Rocks at the world-renowned park's climbing routes break loose and crash down about 80 times a year. The elite climbers who flock to the park using ropes and their fingertips to defy death as they scale sheer cliff faces know the risk but also know it's rare to get hit and killed by the rocks. The slab was about 130 feet (40 meters) tall and 65 feet (19 meters) wide and fell from the popular "Waterfall Route" on the East Buttress of El Capitan, Gediman said. Yosemite geologist Greg Stock said the break was probably caused by the expansion and contraction of the monolith's granite as it heats up during the summer and gets cold and more brittle in the winter.